Probably one of the best dinner’s we have posted so far. 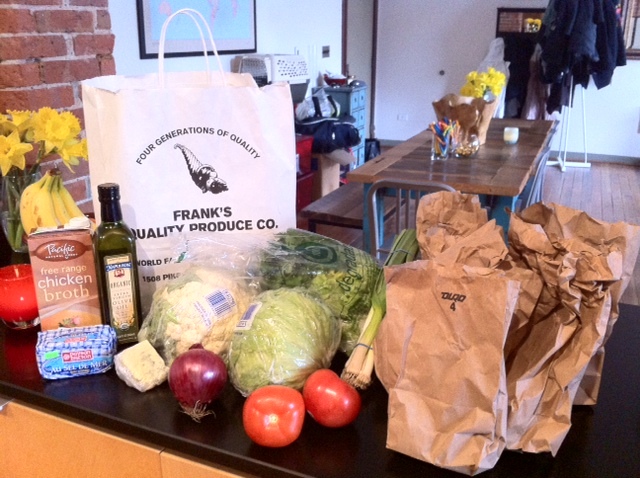 Super simple and refreshing….I swear, one of the best wedge salads I have had in a long time! 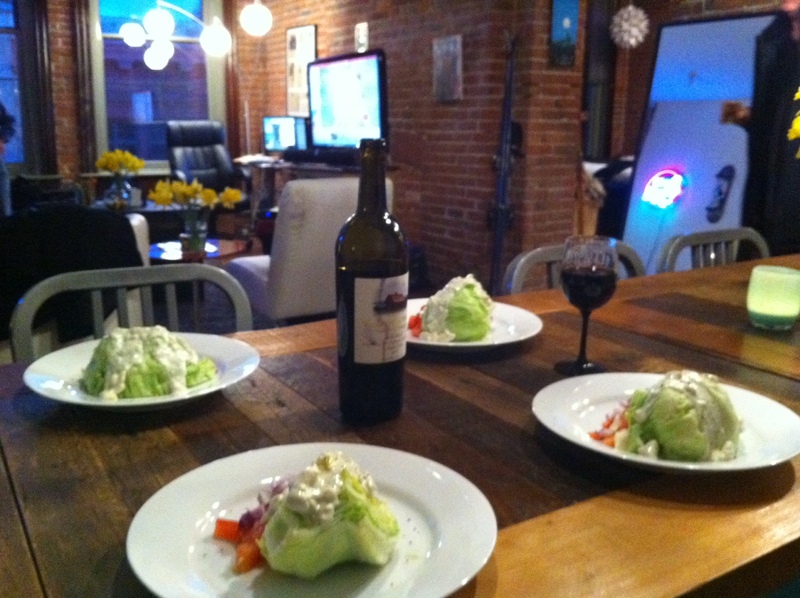 1 iceberg lettuce heads makes 4 salads. Rinse and peel back the first layer of lettuce. Cut into quarters and plate the wedges. Dice 1 ripe tomato and place 1/4 of the tomato on each plate either on top of the lettuce wedge or on the side. Dice just over a 1/2 red onion and place 1/4 of the onion on each plate, again either on top of on the side of the wedge. 1/4 oz crumbled Oregon Blue Cheese (Roquefort or other Blue works too) and mix it with 3/4 cup Lighthouse Blue Cheese Dressing- we are just dressing it up, get it? ;0) Pepper to taste and then pour a 1/4 of the dressing over each wedge. Top with fresh ground pepper and serve! I typically like to have this salad with bacon but with the soup, it was perfect. – In a large saucepan with butter and half of the oil, heat the cauliflower, onion, garlic and potato until they start to sizzle and then cover with the lid. Let sit for about 10 minutes, stirring occasionally until vegetables are soft. 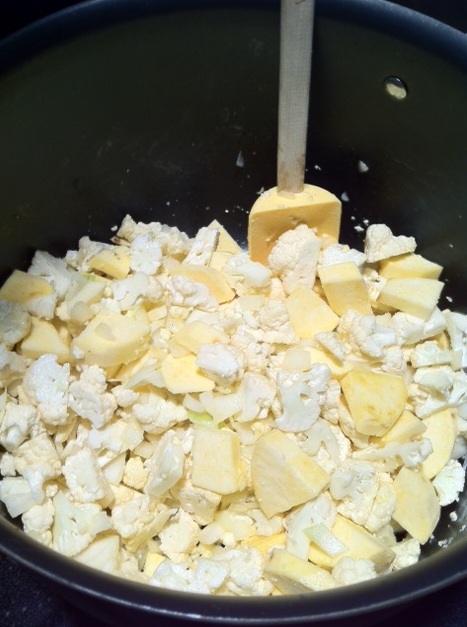 – Pour in the stock and bring to a boil, then add the milk and bring to a boil. Season with salt, pepper and truffle oil/salt. Simmer uncovered for about 10-15 minutes and then add half the cream. – Puree everything in a food processor, in batches while adding the rest of the cream. Push the puree through a sieve with the back of a ladle, wooden spoon or spatula into another saucepan and then return to the heat. 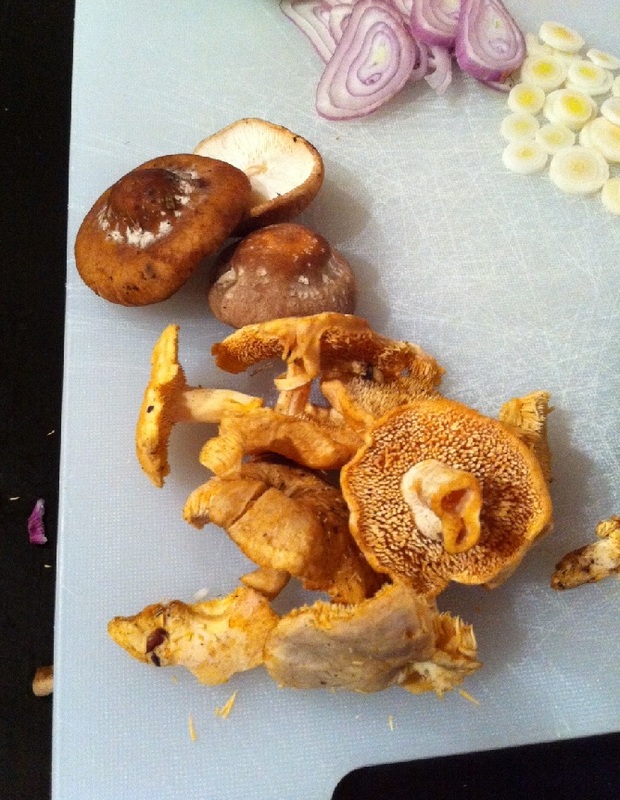 – Stir occasionally while heating on medium heat and add seasoning before plating with the mushrooms. If you have been reading this blog at all, you have surely read about my developing ability to truly saute mushrooms or basically anything. Well this time was no different. 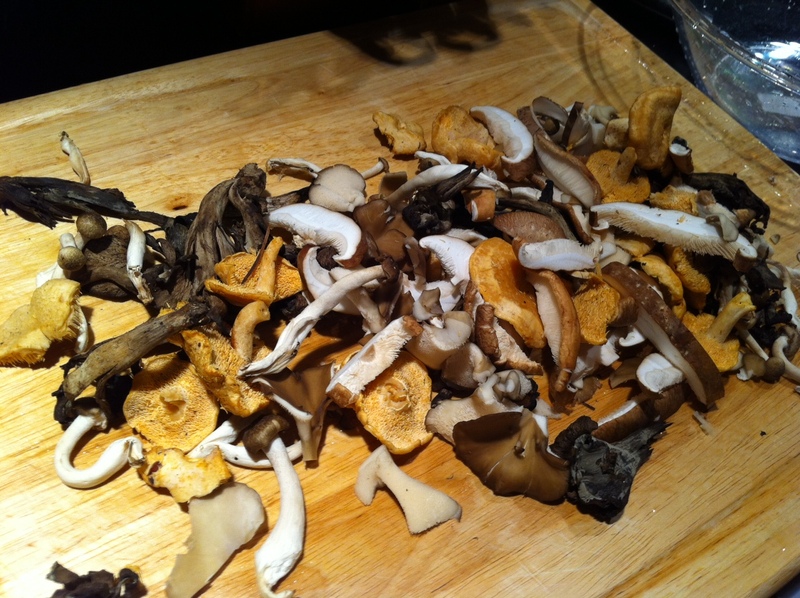 Ash and I bought 4 types of wild Oregon and Washington mushrooms from Franks Produce in Pike Place including: Black Trumpets, Hedgehog Mushrooms, Maitake Mushrooms and Yellowfoot mushrooms (fyi…about a handful of each and we still have some left over). I heated a medium sized sauce pan with extra virgin olive oil. Once the oil gave off a whisper of smoke I threw in finely sliced garlic (think Goodfellas) about 3 cloves and 1 sliced shallot. Next I put in a pat of butter and as it melted I threw in the four types of mushrooms. Listen…if you are scared to use butter then your really not cooking. I bought AWESOME french butter from the Creamery in Pike Place market (behind Jack’s Fish Spot). A couple flips of the mushrooms and I threw in ANOTHER pat of butter! Damn…you feel that:) I added a pinch of salt and fresh cracked pepper. Total cooking time maybe 5 – 7 minutes including the sauce pan heating up. With tongs, place the mushrooms in the center of the bowl. Next pour the soup around the mushrooms. Garnish with fresh flat leaf parsley and a pinch of finely chopped chives. The mushrooms add that meaty-esq flavor and texture to the soup…and I’m telling you…you will love it. Plating! 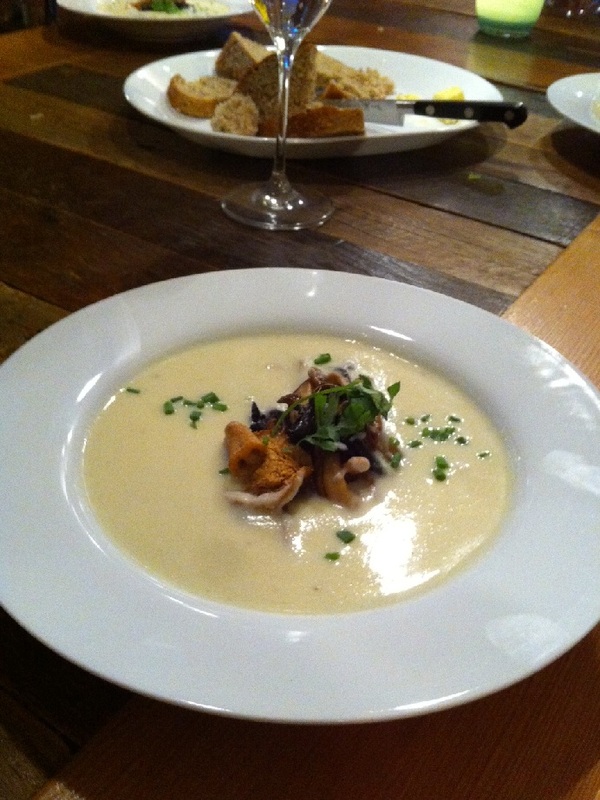 Cauliflower Wild Mushroom Soup...done! Like I said in the beginning, this dinner worked out so well for many reasons…1) cooking with Ash 2) buying all the weird mushrooms you always see but you do not know what to do with and 3) we partied kinda hard this weekend and so a Sunday soup and Salad was awesome. P.S. paired the dinner with a 2008 Columbia Valley Bello Rosso from Walla Walla Vintners (thanks Gordy).